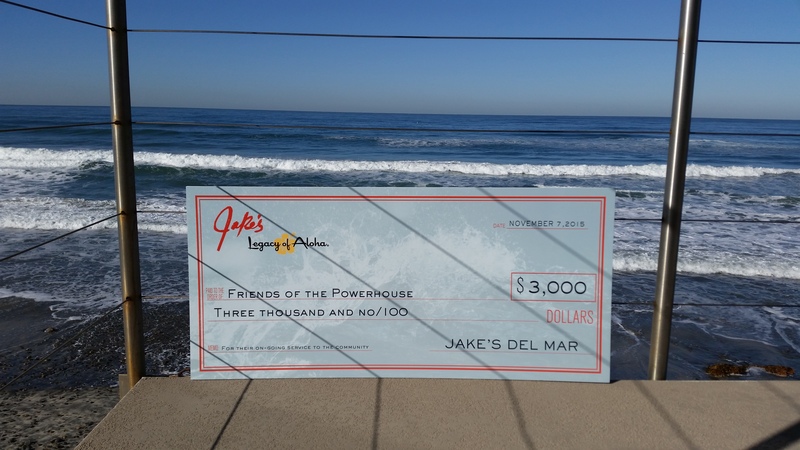 Del Mar, CA … The Friends of the Powerhouse nonprofit organization is delighted to accept a generous $3,000 donation from famed Jake’s Del Mar restaurant in support of its multifaceted efforts to preserve iconic local structures, create and renovate facilities, and ensure that the Del Mar beach and park areas can be accessed and enjoyed by all. Del Mar, CA … For years, one of Del Mar’s best-kept secrets – the Friends of the Powerhouse – has been quietly making a monumental impact on the beach-area amenities that are enjoyed by residents and visitors, and that add revenue and pride to the City of Del Mar. Now, with the launching of its new website at www.friendsofthepowerhouse.org, this nonprofit reveals the many efforts made to preserve iconic structures, create and renovate facilities, and ensure the Del Mar beach and park areas can be accessed and enjoyed by all. It also offers ways for people to support the organization that enhances Del Mar’s exceptional quality of life. In addition to protecting the public, the City of Del Mar’s Lifeguard Services offers an array of engaging and enriching community outreach programs. The nonprofit Friends of the Powerhouse (FOP) is pleased to support these Lifeguard programs as part of its commitment to ongoing beach community preservation and enhancement. Here is a look at annual and ongoing Lifeguard activities. For more information about these and other FOP-related programs and services, visit the website or info@friendsofthepowerhouse.org.